Home » How? 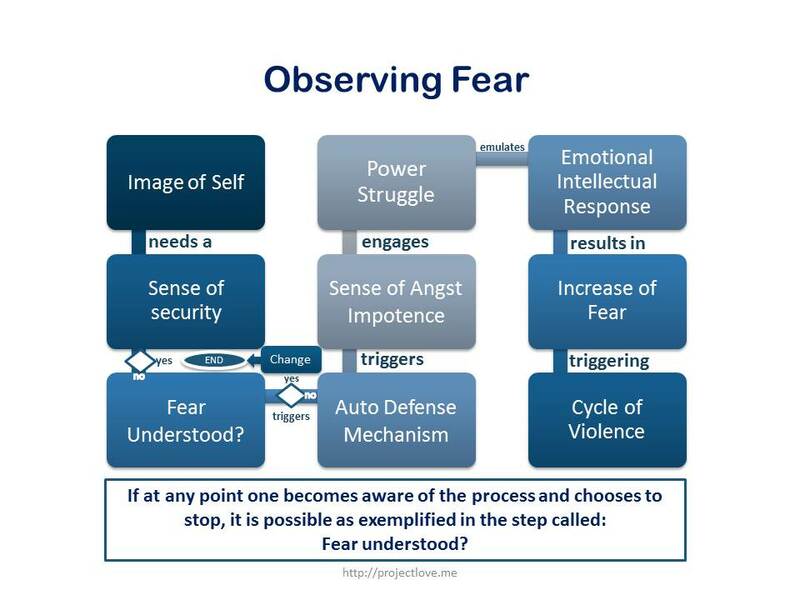 » How does fear create violence? The way fear creates violence is quite interesting. One must first analyze: Where does violence come from? to find out that violence is created from fear. You are free to skip the previous post, but become aware by your own analysis of the fact that violence and fear are intimately tied. The image of self needs a sense of security in order to function. There are different types of security: Physical and Psychological. If there is a threat, then the process of fear begins to be self evident. Psychological security cannot be found in our exterior, but we are taught that it can be found through money, goals, and power. The only thing that can be gained through these “objects” is physical security. However, one must be aware that physical is never really possible. You can have an accident or have “bad” luck. The first step in order to gain awareness is to realize that the concept of security as we have been taught is a total lie. We struggle into finding someplace, sometime, and somehow. It is always a tomorrow to be gained, a past to be overcome, but what happens with the present moment? It gets lost in the midst of the concept we call time. Why have we created a shrine out of time? Why is the concept of time so deeply ingrained in our system of beliefs? This psychological security will never be found outside of yourself. Psychological security depends solely on your ability to understand yourself and be aware of yourself. However as one gets deeper into the process of fear, it might be more difficult to become aware of our involvement in it; unless we are constantly informing our consciousness of this process through mindfulness. Is this true? How Find out by observing your self as you act within violence, fear or sadness. Maybe I am wrong at this, so become an empiricist of your own mind! I am only a guide, not the rule! If I ask you, are you afraid of death? Will you take some time to consider this? Or will you instantly say: Naaa… I do not care about dying. Bring it on! If you instantly answer that you are not afraid, could it be that you are so deep into the process of fear that you cannot recognize it? If you answer again with a simple no, then I ask you: Have you been angry recently? If you answer no, then stop reading! You might not ready to understand this or you might already be pure peace. Your call. No hard feelings! Let’s move on with those who can actually accept that fear is present in their lives most of the time in a very subtle mode or are not actually living inner peace. You might be aware of the fact that you do not live a profound inner peace, but maybe you have never experienced a moment of fulfillment that is not directly related to an achievement. Are you ready so tired of suffering that you cannot bear it anymore? Are you tired of trying to achieve the impossible because there is always more to crawl into? Are you in a state of depression that cannot be ignored any longer? Well, if you are in that state of complete surrender to the reality that is being presented day by day. You feel there is no way out… I have good news for you! The greatness of becoming more aware is always waiting for you! Your suffering is directly proportional to your violence and fear. You might ask: Where does suffering come from? How does suffering relate to fear? It is all related in a very subtle way. You can become aware of it through direct observation of your thoughts and feelings as they begin to creep in and try to control you. You CAN do it! Nothing but yourself is stopping you! Choose inner liberty over goals. I have given you a simple guide with a hypothesis of the process of fear. My theory might not apply to you, but it is a walked path that can help you understand yourself faster.